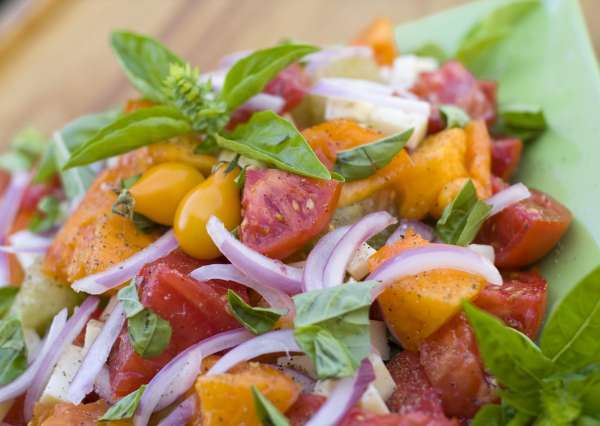 If you’re on the lookout for a light and refreshing salad to enjoy at the end of a busy day, this tomato salad might be just what you need. It could also be a wonderful dish to bring to any potluck gathering! Loaded with vitamin A and lycopene, tomatoes are a wonderful source of eye-healthy nutrients. Vitamin A can help keep your night vision sharp, your eyes lubricated, and could also help lower your risk of developing cataracts and age-related macular degeneration (AMD). Lycopene could also help safeguard against developing AMD. Additionally, onions possess glutathione—an antioxidant that helps to protect your eyes from chemical and oxidative stress. Check out the quick, easy, and tasty recipe below! Mix together the oil, vinegar, sugar, Italian spice, and salt. Pour over the tomatoes and onions, then stir. Optional addition: garnish with basil or parsley if desired. Stir again before serving. Enjoy! Thank you to Elizabeth Joyce for this recipe. For another delicious eye-healthy recipe, check out this blog.